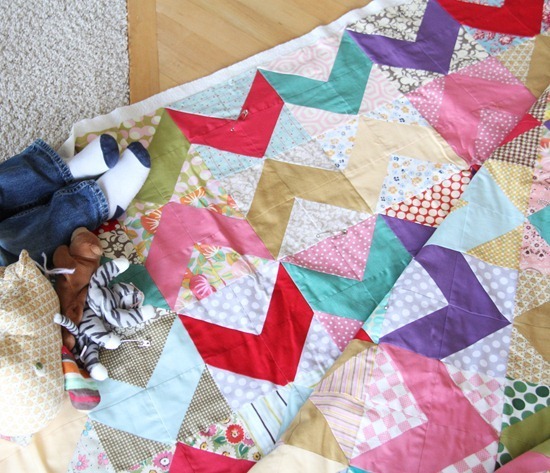 I started this quilt with my Mom back in August….when the owner of those little feet up there couldn’t talk back yet. The chevrons are all cross weave solids, while the backgrounds are a big mix of prints. Together the prints don’t go together at all…but the solids somehow unify all of it. That one is lovely and hand quilted (I think)…but mine will probably get the loopty-loop free motion treatment sometime this weekend. I really like this quilt. I am a typical quilter. I could easily see myself digging through scraps tonight when there are already 4 other projects on my cutting table! Looks great! But that pup steals the show. I need to make this!!! Love!!! Very cool! If only I didn't hate sewing half-square triangles! oh this is alot of fun!! Love the colors…my daughter loves the puppy! Lovely quilt with beautiful colors and the sweet little feet. This reminds me of my grandma's retro 1960's quilts. I LOVE IT. And like Suzan (first commenter) said, "I could easily see myself digging through scraps [this weekend] there are already 4 other projects on my cutting table!" Puppy wants one, too! Love the mix of prints and solids. I like it. I'm glad you're getting around to showing it to us and giving it a finish this weekend. Love this quilt!!! Thanks for sharing it! 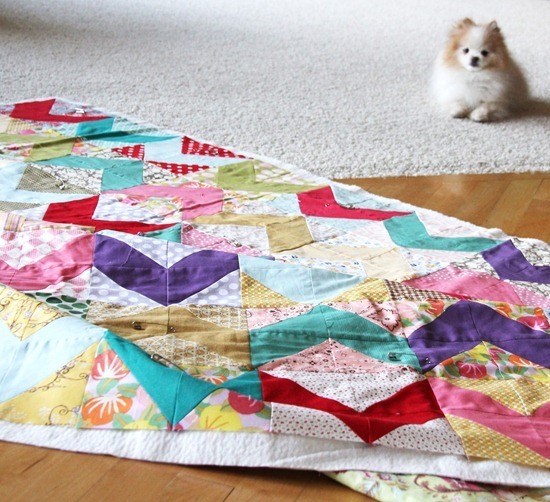 Love your quilt as usual Allison and your adorable pup and baby feet ;) Think I'm going to start your Bizzy Kids pattern soon, love your booklet format and instructions ~ very nice!! It's wonderful! You are so talented. so cute! love the color mix! I almost always prefer the loopty loop quilting over anything else! I love how you took the inspiration and made yours! I love this quilt, I want to try it! I have that page from the magazine pinned to my bulletin board. It's on the to do list. Love yours! Very nice! I am glad you are finding some sewing time! Love this one. Looking forward to seeing it finished. Where could I find this pattern? Ok super cute quilt but absolutely LOVE the pic of Jack in the background. He's such a handsome ball of fluff!! Muy muy bonita y divertida te ha quedado. Felicidades !!!!! this is just gorgeous and am already in my head rummaging through my scrap bins! Perfect scrappy project, something gorgeous from things that wouldnt seem friends in first appearance. It's beautiful and it's so different, I really love it! So pretty! I love how it just takes scraps. Did you say that you are going to quilt that by hand? impossible to see from picture, but what magazine is this? (you musta known someone would ask….!!!) hope i have it sitting on my shelf!! great quilt!! Can I ask a question for you? I'm using the batting I think that you have put in your top and I have a Bernina …. question …. when you make straight line put a particular tension on your machine? Unfortunately my back is a bit horrible at this moment …. many crunkles … and I don't understand what is wrong!!!! Very pretty. Scrap quilts are always my favorites. I am partial, however, to the cute little feet, even if they are now connected to a saucy little mouth! You truely are amazing…how do you do it all…kids, a very cute puppy, pattern business, wife, etc…you inspire me. I work at a quilt shop and we sell a large amount of your patterns. I also teach at the shop and a lot of my students make quilts from your patterns…they are a hit. I would love to be able to sit down with you and have you tell your experience with Quilt Market…i would love to one day have a booth, but i don't even know where to begin the process. Any tips you have would be a help. Happy Sewing. PS LOVE the Chevron quilt. I really like this quilt! Are you going to be at KC? I have the same questions as Janae King. Are those 5 inch squares? So beautiful :) ii really like this quilt too! And both pictures are adorable! I love your work. I just started a blog and did a post about quilting and sited this blog! I am smitten with chevrons right now too. I don't quite know why, but I can't stop. Even my blog is flanked with yellow chevron. I think I would do a big ol' chevron wall in my house if I could. Hmm…now, that's an idea worth noodling on. 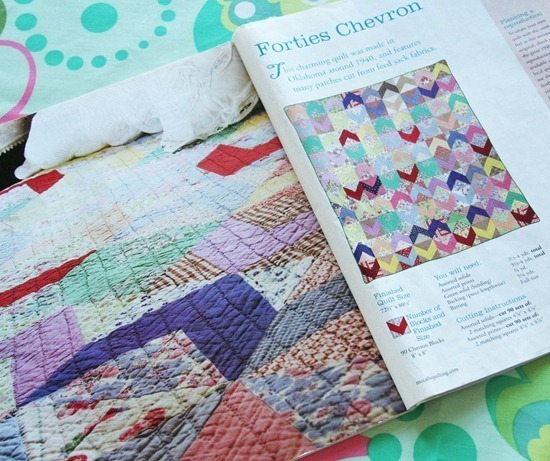 I wonder if you could modpodge fabric chevron on a wall? I digress. Back to the point…I'm about to dive in to make your sweet baby quilt tutorial with some Darla by Tanya Whelan. I can't wait to see the finished product! Keep up the great work, Amy! Found the pattern and am so inspired to try it as well. i really like your quilt. you are right, the solids do help pull it all together. You "slay" me – in a really good way! Just gorgeous work! And that little pup is the most A-DORABLE thing I have ever seen! Cute baby feet but the puppy is gorgeous. Oh forgot to say like the quilt too. I love scrap quilts! And I love that this one doesn't scream "100 designer fabrics in one quilt." Not that I don't love designer fabrics, it's just refreshing to see a little different look.